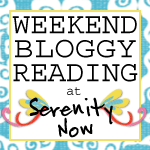 Have you entered the fabulous Scentsy Giveaway yet? Stop by before Sunday evening to win a beautiful warmer and scent. Without further adieu, here's what caught my eye this week. ~Lindsay discovered chalkboard fabric (it does exist!) and she made some fab baby tags. 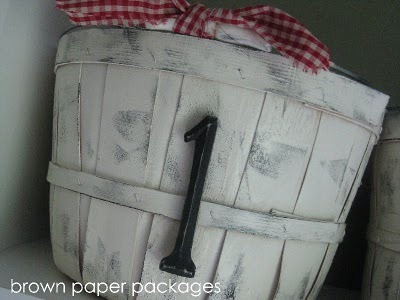 ~Absolutely precious distressed Painted Apple Baskets. ~Kate had an unexpected surprise during her Bistro Set Makeover. ~My sister broke my heart. ~Kim shared how she got started on Cooking some Freezer Meals. ~Pottery Barn Knock-Off alert! 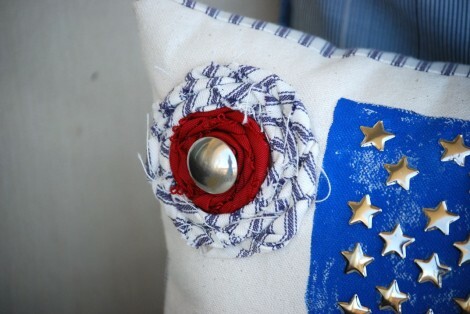 Check out Cre8tive designs' Patriotic Outdoor Pillow. Love! ~Melissa shared about The Simple Pleasures of Summer. And guess what? That doesn't include Disney World. That made me feel so much better about not being able to afford a trip to "The Happiest Place on Earth." ~Ashley shared some Photo Taking Tips for those of us who suffer from "Big Fancy Camera Envy." Busy weekend here! My sister flies in from Texas tonight for a visit. Our plans for the weekend include some pool time, story time at Borders, and a baby shower on Sunday afternoon. Excitement! Special thanks to today's Sponsor, Mississippi Mud. You forgot make-up time! Tracy said she's bringing all her make-ups! Woot! What cool projects. Loving the chalkboard fabric...that is terrific. Must get me some. My plans this weekend is to go see Cirque de Soleil!! WooHoo!! Taking two of my grandkids. LOVE the chalkboard fabric! I'm going to have to get some of that! I love your linky love posts. I will have to check out those ideas. Wonderful! So sorry I never made it over to your Dishing It party. I am going over there right now to see what everyone had to say about their dads/husbands. We had some family drop by unexpectedly yesterday and it threw everything off for me. This weekend I am going to California for a wedding. And I get to see my sister and her little baby - so I am very excited! Thank you for these links! I'm so far behind on blog-reading. . . not to mention blog-writing. It's nice to have some good links from someone I trust! I hope you have a WONDERFUL weekend with your sister. Baby showers are so much fun! Enjoy yourself! 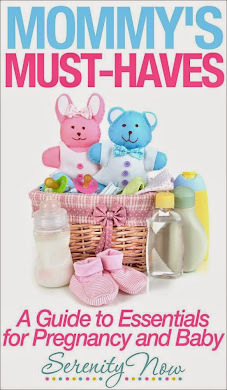 Those baby tags are so cute! What a fun idea..I have never heard of chalkboard fabric, but how cool! And what an experience for your sister. I sure did...I did entry the Scentsy giveaway! As for weekend plans...The Klipsch company (reknown maker of fabulous speakers and accessories) is having a big pilgrimage celebration here in our town (where Mrs. Klipsch, the wife of the late inventor of these speakers lives..and is my neighbor). Concerts in the park all day...and we (well, my hubby and stepson) have to film it for tv viewers, since he owns/operates the local tv station. So..lots of music and heat for us today but it'll be fun. I hope you enjoy time with your sister! My sister lives in Phoenix, and I in Arkansas..so I don't get to see her much. I treasure the times we do get to visit! Have fun! !